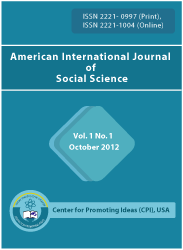 American International Journal of Social Science (AIJSS) is a double blind peer reviewed journal published by Center for Promoting Ideas (CPI), USA. The main objective of AIJSS is to provide an intellectual platform for the international scholars. AIJSS aims to promote interdisciplinary studies in social science and become the leading journal in social science in the world. AIJSS publishes original papers, review papers, conceptual framework, analytical and simulation models, case studies, empirical research, technical notes, and book reviews. Special Issues devoted to important topics in social science will occasionally be published. A Study On Burglars’ Target Selection: Why Do Burglars Take Unnecessary Risks? Principal as Instructional Leader: Did the States Lose Sight of the Dream? Why Do Educated, Successful Women Leave The Workforce?